"S H A Z A M!" Captain Marvel began as any other superhero at that time. Fawcett Publications saw how popular comic books were becoming and decided to open a comic book division. Bill Parker, who had written all the other features to appear in Flash Comics #1, created a story about a team of six people who were each given a mystical power. Fawcett executive director Ralph Daigh suggested merging the heroes together into just one hero. 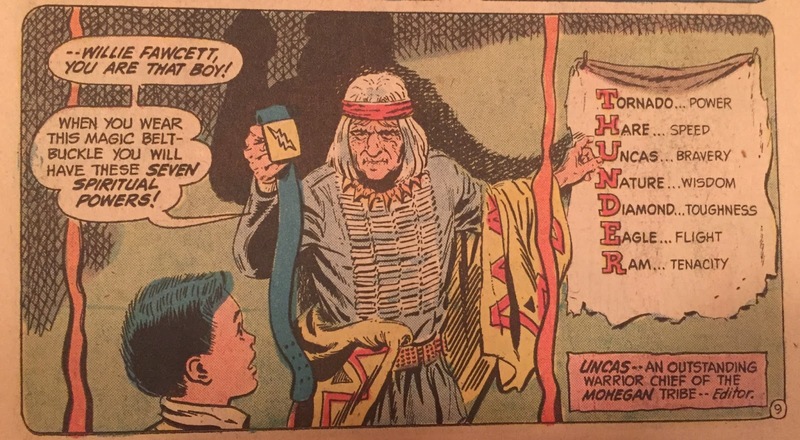 Parker agreed and created Captain Thunder, along with C.C. Beck who created the design. Flash Comics was sent to the printer and published in order to obtain a trademark along with another comic called Thrill Comics with the same content. 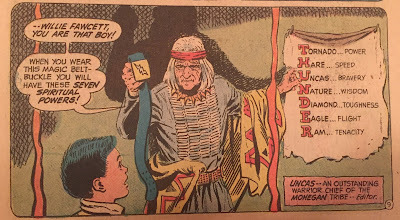 Fawcett failed to secure the trademark on either title and Captain Thunder. They renamed the comic Whiz Comics with #2, renamed Captain Thunder Captain Marvel and introduced their new hero in almost the same way that DC did with Superman. They even copied the guy in the green pants. The look of Captain Marvel was inspired by Fred MacMurray while everything else was added in tribute to Fawcett and its founders. 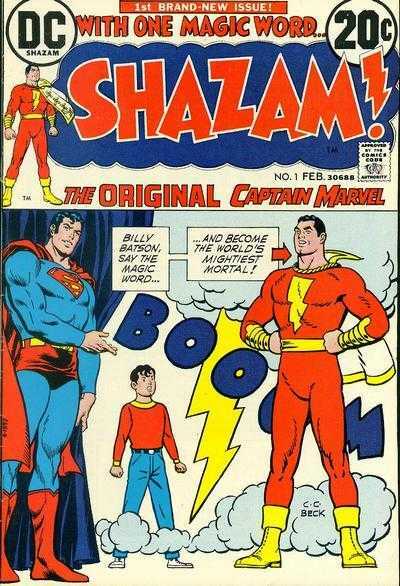 Billy Batson was named for founder Wilford Fawcett, who went by "Billy", Captain came from Fawcett's rank in the military and even Whiz Comics came from Fawcett's first magazine Captain Billy's Whiz-Bang. Parker and Beck even took the more familiar aspects of Superman (alter ego, reporter, most of the powers) and put them into the character. The major difference was that all of this was put into a 10- to 12-year-old boy. Captain Marvel was an immediate success and became the best-selling character of the 1940s spawning a whole franchise of ancillary characters known as The Marvel Family. By 1944, every Fawcett comic featured one of the Marvels and several solo titles were created. In 1944, National Publications (now known as DC Comics) sued Fawcett over copyright infringement. The two companies tried to settle the conflict out of court but in 1948, the case went to trial. The judge ruled that National had failed to properly register the Superman copyright so there was no infringement involved. 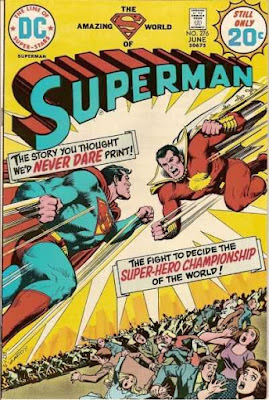 National appealed and another ruled that while the Superman copyright was valid, no infringement could be seen on the character itself but on certain aspects and stories of the character. The judge sent the case back down to a lower court but by this time, comic books had fallen out of favor, especially superhero comic books. Fawcett agreed to an out-of-court settlement. They ceased publishing comics by 1954, paid National $400,000 in damages, and agreed never to publish the character again. In 1972, looking for new characters that they could publish, DC bought the rights to Captain Marvel from Fawcett and a new series called Shazam!, due to being unable to use the name Captain Marvel because of another character named that who was owned by Marvel Comics, began the next year. 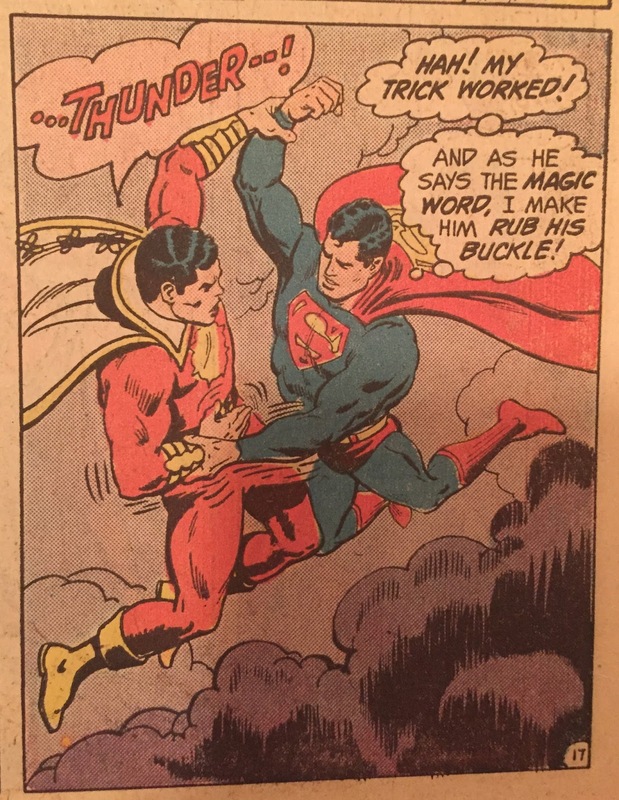 The following year, in 1974, Superman #276 went on the shelves introducing a new villain for Superman--Captain Thunder. Everything about Captain Thunder was similar to Captain Marvel except for one crucial detail: Instead of a yellow lightning bolt on his chest, there was a yellow sun burst. All characters and stories (C)1974 DC Comics. All rights reserved. "In a dingy Metropolis alleyway appears a brilliant flash of light that suddenly becomes a bewildered Willie Fawcett" is how the story starts out. Willie looks exactly like Billy Batson except for his crew cut. The narration box tells us immediately that Willie has strange and enormous powers. Willie catches a glimpse of Superman flying through the air and wonders out loud who it is. A drunk man says that it's Superman which confuses Willie even more. He takes a bus (35 cents!!) to where he thinks some place called WHAM-TV is but instead finds Galaxy Broadcasting. 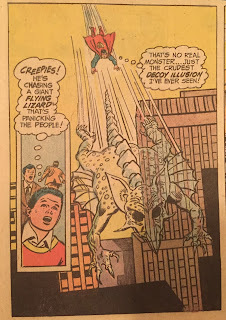 Once again, Superman flies by in pursuit of a weird, see-through flying lizard. While Superman is tangling with the lizard, Willie notices a helicopter closing in on an armored car. With a rub of his belt buckle and saying the word "T H U N D E R" Willie transforms into Captain Thunder. But as Captain Thunder flies off, something strange comes over him as if he mustn't stop those crooks. Captain Thunder arrives to help the criminals (!) and takes off with the armored car with the crooks in the helicopter close behind. 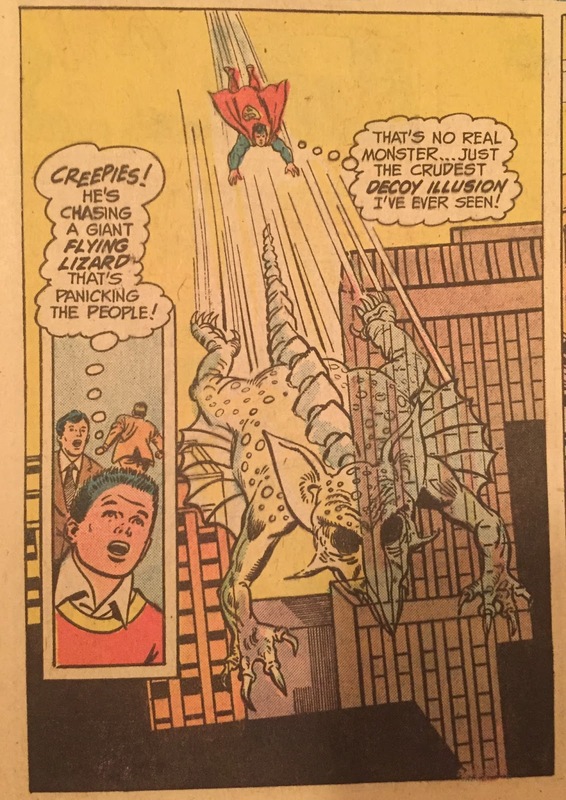 Superman finally disposes of the flying lizard who was apparently a menace to the city despite being just an illusion and discovers another costumed person helping the crooks escape. 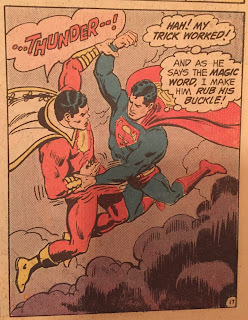 Superman tells Captain Thunder to surrender but is instead kicked in the face. Captain Thunder throws the armored car at Superman and returns to his alter ego of Willie Fawcett, who doesn't know what the heck is going on. Willie decides to return to the Galaxy Building to see if someone can help him get a word to Superman. He is directed to Clark Kent who listens to Willie tell the story of Captain Thunder's origin. Turns out that Willie is an orphan and every year the orphan kids were sent to summer camp which I imagine was just an excuse to get the kids out of the orphanage so they could bug bomb it and one summer, while everyone else was asleep, Willie followed an owl into a mystical cave where he meets Merokee, a Mohegan medicine man. Merokee reveals that legends foretold that Willie Fawcett would be given great powers. With Captain Thunder here, Merokee goes to "a far better place" leaving Captain Thunder to fight evil. We get glimpses of Captain Thunder battling bank robbers, not-Doctor Sivana, and rescuing ships from storms. The last thing that Willie remembers is battling the Monster League of Evil which consists of the Universal Studios Monsters (Dracula, Frankenstein's Monster, the Mummy, and the Wolfman). Thunder traps them in another dimension but Dracula laughs that they did something to him and that he will never be the same. Willie thinks that he has arrived in the future but Clark tells him that Captain Thunder has never existed on his Earth. Clark agrees to help Willie but thinks that the boy is delusional. Soon, Clark, Lois and Willie are walking to the police station to see if anyone has reported Willie Fawcett missing. Clark notices that a criminal is breaking out of jail and runs off to grab a hamburger for Willie but instead turns into Superman to stop the vehicle that helped the criminal escape. As a reflex, Willie rubs his belt and shouts "Thunder!" turning into Captain Thunder who slams into Superman causing the criminals to escape. should snap him in half. soon, Thunder is able to break whatever spell the Monster League of Evil had on him and knows how to get him. He rubs his belt buckle again, says "Thunder" and is gone to whichever planet Captain Thunder calls home. In the epilogue, Lois convinces Clark to take her to lunch at a fancy restaurant and Clark opines in his head that he's glad that somewhere Captain Thunder is fighting for the weak and helpless for no other reason than because it is right. 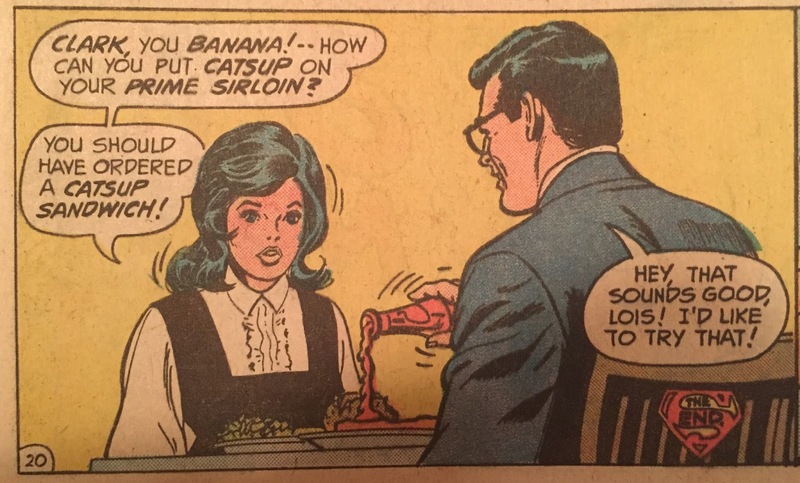 Clark's prime sirloin arrives and he promptly pours ketchup all over it, baffling Lois, because God forbid Clark not act like a doofus for once in these stories.